The film comes a decade too late. Post 9/11. Racial discrimination and hate crimes are rampant in the US. 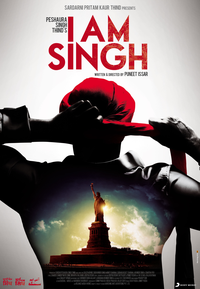 Ranveer Singh (Gulzar Chahal) a young Sikh settled in India rushes to America when his family falls prey to one such hate crime. I Am Singh tests your patience. With an overused plot and absolutely zilch efforts on execution it's best avoided. 'Ok guys, enough'. This is what you wish to scream out loud by the time intermission flashes for 'I Am Singh' which is yet another take on racial discrimination. Okay, so the makers (in this case Puneet Issar) may argue that just like boymeets-girl theme continues to find it's way into cinema all over the world, even the subject of racial abuse could be told repeatedly provided the setting and characterisation are different. Well, there is a difference though and that lies between a happy theme versus a sad theme. One could go through the latter as well but provided the narrative is engaging enough and there is a fair bit of entertainment sprinkled as well. Unfortunately though 'I Am Singh' misses on both counts due to which it turns out to be a film that would hardly be registered as a milestone movie on the subject. I Am Singh is a poor fare that might see some initial footfalls in cinemas of East Punjab circuit. However, its messy script and drama will seal its fate at the box-office. Disaster. The film opens with its title imprinted on the bottom stripes of the American flag.